I wore this look (60 degree Decembers in New York call for bare legs as long as possible!) to my 20 week ultrasound check up this past week–I knew I wanted to wear this Zara faux fur jacket, so I kept the rest of the look fairly simple with no frills or patterns– this grey simple form fitting (bump showing!) dress from Forever 21 with my fave white sneaks and a ponytail. I love the kind of glam rocker vibe of the jacket contrasted with the simple tomboyish feel of the rest of the pieces, and can’t wait to wear this jacket with SO many other looks this winter. Another one of my fave ways to wear faux fur is over distressed jeans and a vintagey looking tee– and surprisingly, I RARELY wear a jacket like this over fancy stuff like a cocktail dress — I guess I tend to gravitate a little more to the unexpected. I rounded up a few other black/navy faux fur jackets similar to mine (all my exact pieces are shoppable above) along with other similar items for you to create a look like the one above! Hope your own pair of fresh white kicks helps make saying goodbye to summer a little easier for you guys! 2) What outfits do I build around this piece? 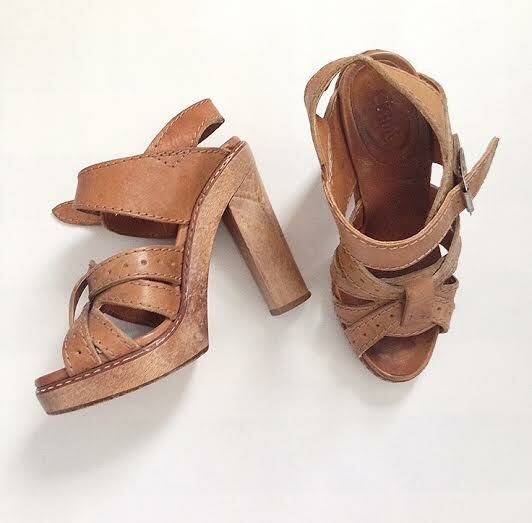 As I perused my shoe closet, I came upon these Chloe wooden platform sandals. I remember buying these sandals very vividly– at a Bergdorf summer shoe sale way back in maybe 2005 or 2006. This was just near the end of Phoebe Philo’s time at Chloe; and in my opinion, the height of Chloe’s success and notability as a fashion house. They were doing lots of babydoll everything, flowy, feminine, very 60s and 70s style short dresses, all paired with chunky platforms like these. It was literally love at first sight with these guys– they are my favorite kind of mix– masculine and feminine, sweet and fashion forward, reminiscent of the 1970s, yet modern paired with all my favorite short dresses. I have so many good memories in them…My 24th and 25th birthdays were both spent in these shoes; one of my best girlfriends and I “shared” them on a tipsy walk home during a girls’ weekend getaway, when she couldn’t wear her shoes any longer because her feet hurt, yet we couldn’t bear the thought of her walking barefoot. They are comfortable as any sneaker could be, and extra plus— they add a good 5 inches to my small frame! So what was there to decide you ask (as I cleaned out my closet)? Why weren’t they automatic keepers? For the past few seasons, after reigning as the shoe style of choice for the first decade of the 2000s, platforms were “out”. Single sole, flat, streamlined, simple and clean shoes — minimalist in nature– completely took over. Platforms became synonymous with the cheesiness of a Real Housewife’s over highlighted style. If you were well-versed and well-heeled in fashion, you wore single soled shoes. Period. Then, this season, the 70s came back– in a big way. Chloe, Gucci and Valentino all showed platforms– paired with flared pants, short dresses, A-line minis and maxis. All the shoes that came down the runway were similar to my cherished Chloes! These were not going anywhere. So what’s the moral of this shoe story? 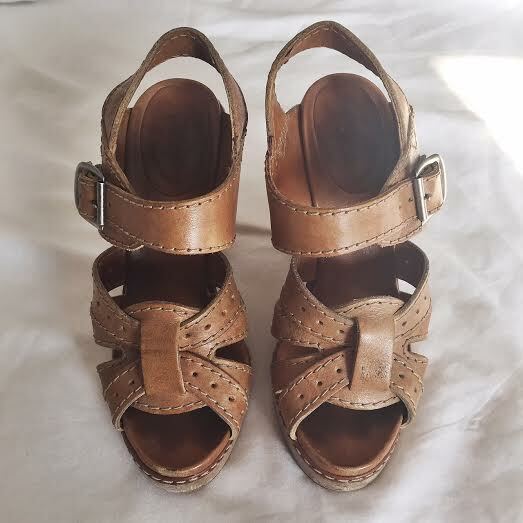 No, it’s not to be a slave to trends, and keep only what’s in style– after all , I’ve cleaned out my closet every spring for the past 5 years, and haven’t gotten rid of the wooden Chloes just yet. Some pieces, like people, will always be in your life. They just make you feel good, and even though you don’t visit them every day, they show up just in time when you need them. So if a piece feels like it hits that rare sweet spot between trendy and classic, hang on to it! What are your most cherished pieces? What pieces have come “back” and you’re glad you kept? Leave a comment sharing below! 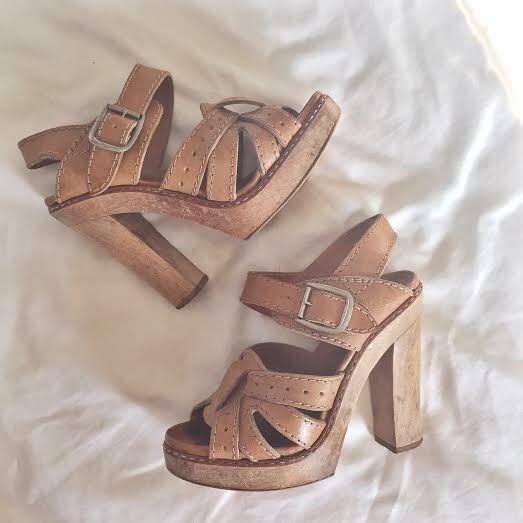 Since my Chloes have been sold out for years, I linked several similar styles in various price ranges below– happy platform shopping!